I was about to start packing up my workspace when I decided I should take a quick picture of it so I could show you all where the magic has happened for the past few years. It’s a small space for sure (just a nook in the corner of our kitchen), but it’s been nice to have a space to call my own. As small as this space is, it looks like my new one will be even smaller. I’ll be sure to post pictures after I’m all settled in later in the summer. And with that, I bid a fond adieu to my little workspace! Here’s where the magic happens! See the chalkboard I painted on the wall for doodling new ideas? Some of the materials I have in stock. That shelf? I built it myself out of some Ikea bed slats I found on the curb. Yah, I’m handy like that. Double lazy Susan…what does it mean? 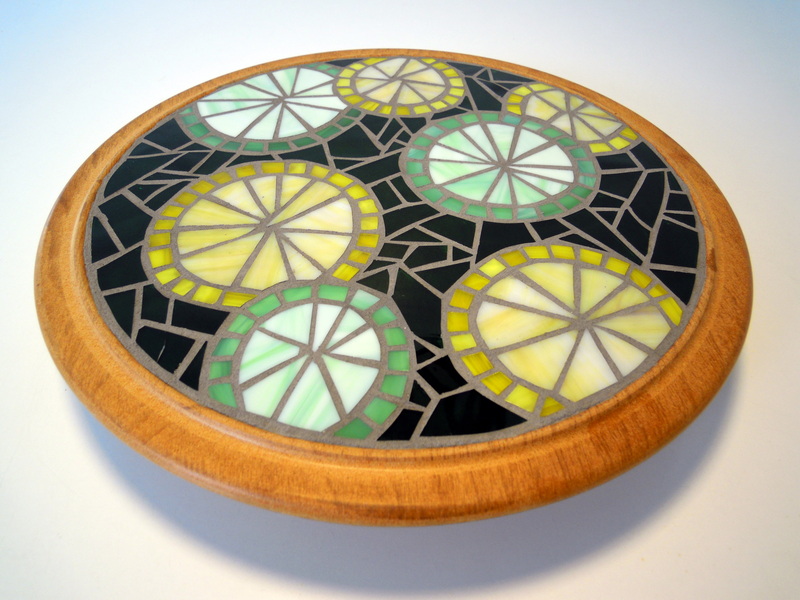 When I was home in Kitchener for Christmas, my aunt and I were chatting about me making a lazy Susan for her. Since my parents have what’s known in layman’s terms as “the world’s slowest internet…ever”, I whipped out my phone (I rock an Android, in case you were wondering) and we browsed through my mosaic flickr stream to get a sense of what kind of style and colours she was drawn to. You know, for a girl who has never owned a cellphone before (and who generally has a strong aversion to obnoxious public use of them), I’m finding mine very handy! 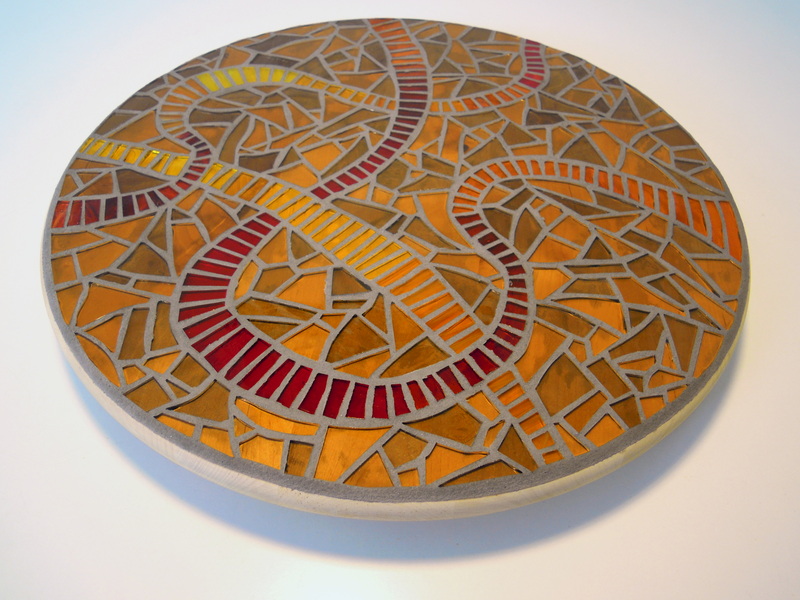 The back-and-forth process of coming up with designs for the mosaics was new to me. My only other commissions had been relatively simple: one was a mashup of two mosaics I had already made, and the other was simply translating a logo into mosaic form. In other words, less “artistic freedom” for me. But these lazy Susans were different. I had a few shapes, styles, and colours to use as a point of departure, but then it was up to me. Truth be told, the freedom made me a bit nervous! But in the end, it wasn’t nearly as painful as I thought it might be, perhaps because my aunt was a very easy-going “client”. 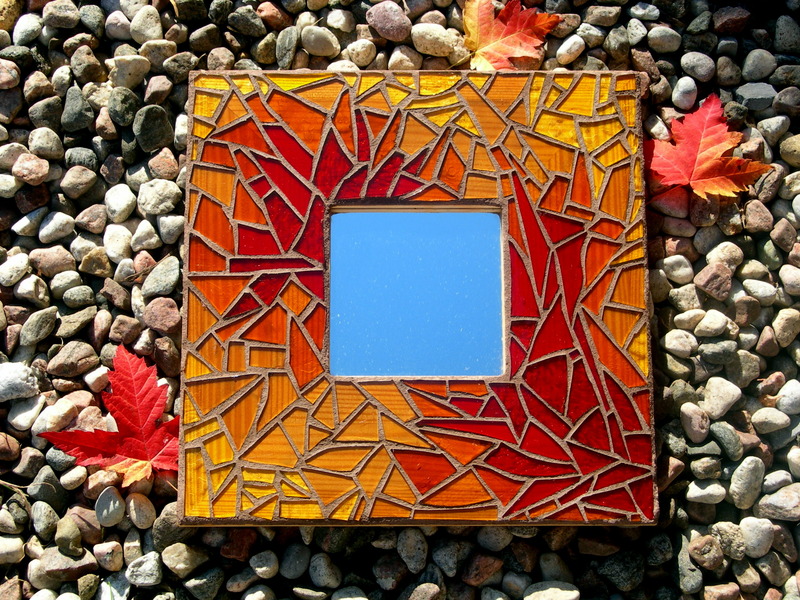 I tend to associate each mosaic I do with the music, TV shows, or movies that are playing as I work. In this case, it was the final few episodes of Season 1 of Breaking Bad, a really fascinating episode of The Nature of Things all about raccoons, and the movie Food Inc. Also on high rotation was the soundtrack to Parenthood, particularly the Josh Ritter song that’s on it, which I’m pretty much obsessed with at the moment. 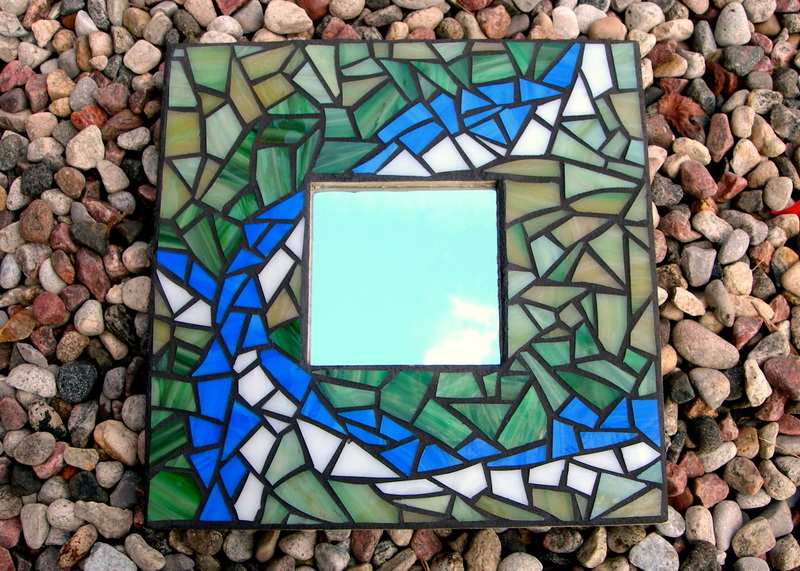 I made this mirror waaaaay back in the fall, just after my partner moved to California to start a new job. It was a big adjustment, living alone again. I found that I had a lot of time on my hands, so I threw myself into making mosaics. This was one of the first ones I did after we started living apart, and also one of the first ones I did while we kept each other company over Skype. It was kind of nice, just knowing she was there. We chatted a bit, but mostly we just stayed on the line while we each did our own work (cutting and gluing for me, planning classes and marking for her). All I can say is thank goodness for Skype and for the distraction of being crafty (oh, and for the company of our super cute dog), because I think I might have gone nuts otherwise. Every time I go home to Kitchener to visit my family, my mom unfailingly leaves a pile of her already-read magazines on my old dresser for me to thumb through. I use them for 2 things: (1) to find new recipes and (2) to clip out little swatches of inspiration from ads or stories about the top 10 <choose 1 or more: couches, dresses, dinnerware, throw pillows> that you need to have for <insert current year>. 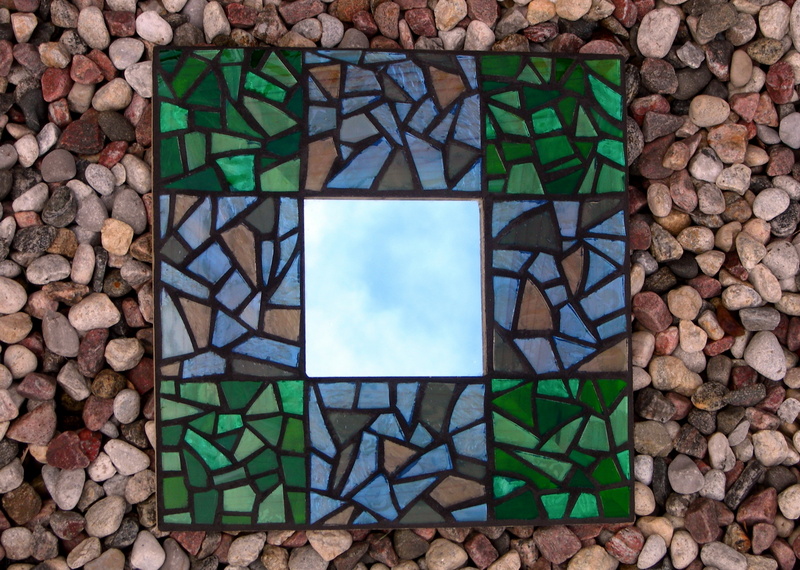 That’s where the inspiration for this mirror was drawn – some pattern that I tore out of a Chatelaine, most probably (I likely scored a killer chocolate chip cookie recipe too!). I think it was originally cherry blossoms, which, in a random stream of thoughts, makes me think of that Andrews Sisters song, “I’ll be with you in apple blossom time.” (Although I’m quite partial to “Bei Mir Bist Du Shoen.”) And no, I’m not ashamed to admit that I have both of those songs on my iPod. In fact, I have the whole “Best of…” album. So there! One of my favourite blogs, Ikea Hacker, featured my quetzal table today! It’s totally fun to see my blog stats spike. Anyway, just thought I’d share the good news! P.S. My mirrors and lamps are also Ikea hacks, just in case you were curious. This is, by far, my favourite mosaic I’ve done so far. Have I said that before? Well, it is (for the time being). I really really love it. There’s just something so simple about it. Clean and elementary. Art-savvy readers will already have noted that it was inspired by the art of Piet Mondrian. However, art-savvy I am not. I’ll be the first to admit that I don’t really know anything about art. Not history, not composition, not technique, not styles, nothing. In fact, I discovered Mondrian by way of an amazing British television show, Hustle. I don’t want to say too much about this one – I think it’s better left to speak for itself. Enjoy! I love fall. I really do. I love fall. It’s my favourite season, by far. Spring comes a close second, but it’s a bit too muddy for my liking. Summer? Too hot. Winter? Too cold (especially here in Ottawa). But fall… Fall makes me want to go for a hike and grin at the satisfying crunch of fallen leaves underfoot. Other reasons I love fall: hearty soups, apples (especially my favourite, Tolman Sweet), that “back to school” energy in the air, Thanksgiving dinner, and, oh yah, the colours. Who doesn’t love fall colours? So rich and earthy. 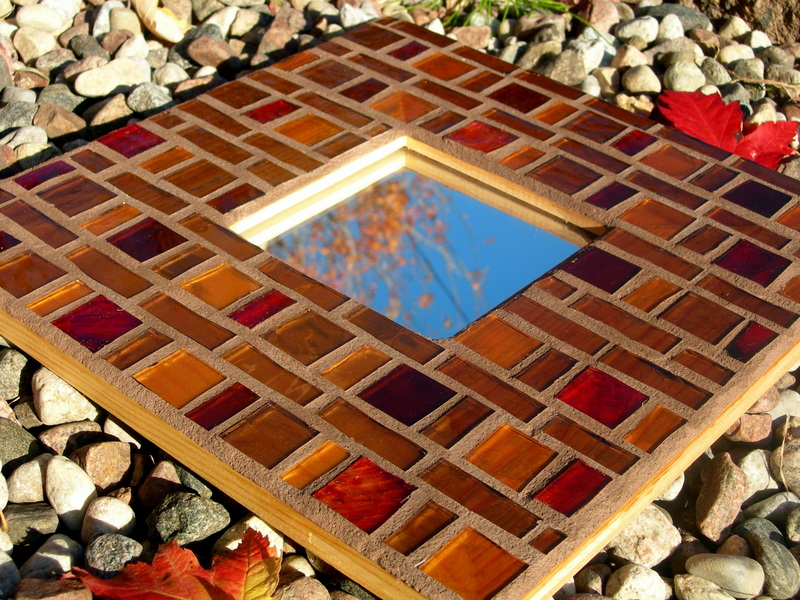 And I think that’s what I love so much about these 2 mirrors: the fall-like colours. 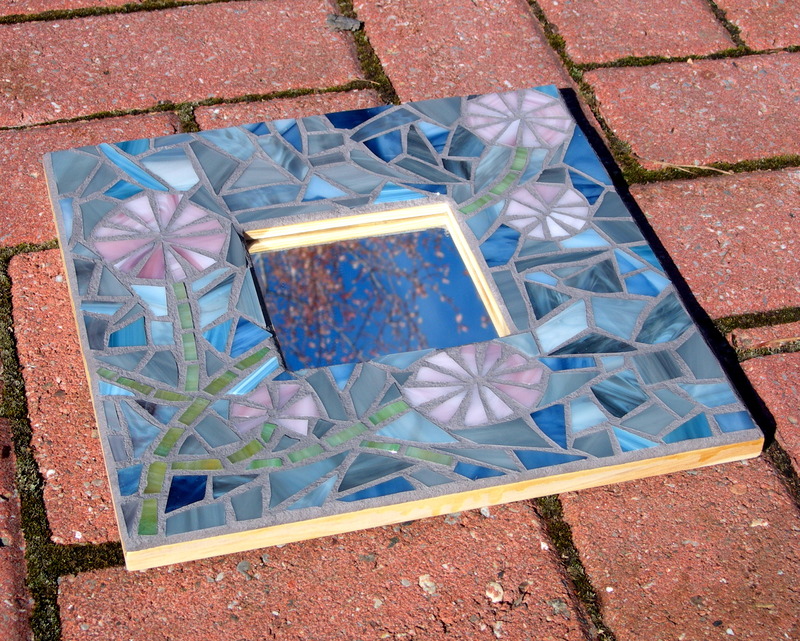 Now, this first one was actually the first mirror I made in this little ‘series’. It was a while ago, so pardon me if I’m a little fuzzy on the details. I do remember we watched “Elizabeth: The Golden Age” while I was cutting and glueing all those squares. Not a great movie – it definitely didn’t live up to the first “Elizabeth“. The second mirror is my favourite one of the whole bunch. I love the colours and I love that you can see the grain of the wood through the glass – I think that sort of organic aspect is a great contrast with the hardness of the glass. This mirror is a great example of me having a plan and not following it (and the end product being much better because of it!). Originally I wanted to split the mirror into 4 differently coloured sections radiating from one corner (can you picture it?). But then I looked at the colours of the glass that I was being drawn to and thought that a sort of fiery freeform design would be much more interesting. And I do believe it was! It was also nice to work with the existing shapes of the glass scraps again – that’s really what I love doing and it’s when I feel most inspired. I was home alone the weekend I started work on this mirror, so I needed something (read: a TV show) to entertain me while I worked. You know, take my mind off of my knotted shoulders, bleeding hands, and blurry eyes. The trick was that it needed to be a show that I found interesting enough to have it on in the background and not get annoyed, but one that I wasn’t dying to see, otherwise I would spend my whole time watching and my mirror would sit unmosaicked. My solution: Degrassi TNG. Yes, this mirror was made to the soundtrack of Season 7 of Degrassi TNG (that gives you an idea of how long these things take to make, eh?). This does not embarrass me. No, au contraire. I am a proud Canadian: I love CBC, Degrassi, maple syrup, and the fall colour palette. And I hope you love this mosaic. This mirror is part of a whole slew of mirrors that I banged out in preparation for the Sandy Hill craft show (more scintillating posts to follow soon). I was lucky enough to find a whack of these Ikea Malma mirrors at various garage sales all over Ottawa this summer. We actually had fabulous luck in the garage sale department this summer. Humour me by letting me regale you with a tale of our garage sale luck. Let’s get back to business. The mirror. At first I wanted it to have 8 different coloured squares. Then I looked in my glass bins and was horrified to see that my colour selection was severely depleted. I couldn’t even scrounge up 4 colours (well, 4 colours that looked good together). In fact, even the 2 colours I picked were a bit scant, so I had to supplement them with grey. It’s times like these when I find myself wishing for a wealthy arts (OK, crafts) patron for whom money is no object and who will keep me well supplied with fabulously gorgeous glass (and tasty wine and coffee with milk and dark chocolate…). What? A girl can dream, can’t she? This mosaic was kind of a cross between 2 previous projects, which diligent readers will know and recognize. After seeing a picture of the lamp and the small checkered plate I had made, a friend asked if I could make a colourful checkered lamp for her son’s room. I, of course, eagerly accepted the job. I was pretty excited about the project for a number of reasons: (a) it was my first commission, which was kind of flattering, (b) i thought the end product was going to look absolutely smashing, and (c) the checkered pattern meant that it would be a fairly quick job to finish (at least the gluing part). What I didn’t expect were the endless shards of glass that kept lodging themselves in my poor hands as I cut all the squares. Yes, by the end of this project I was an expert in extracting those little bastards from my skin (or biting my tongue as my partner did it for me using an assortment of pins and tweezers under a harsh bright light). I think the end product is fun; the colours make me smile for some reason, and I think they really stand out in the white grout. And I’m glad I didn’t make the squares perfectly symmetrical – how boring would that have been? Anyway, I hope wee Josh likes it and gets many years of enjoyment out of it (at least until he enters that teenage angst phase).